How do you remove eyelashes permanently? You are here: Home > Eyelid Surgery > How do you remove eyelashes permanently? 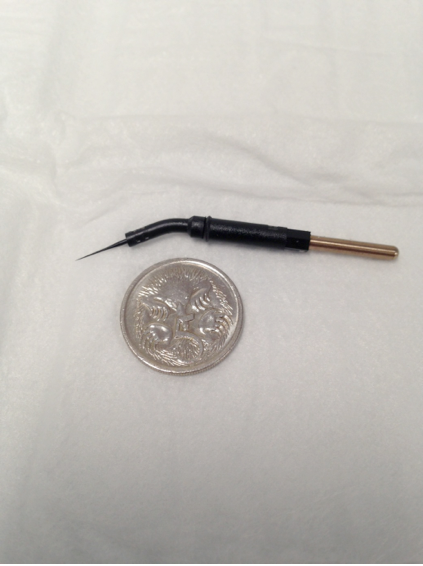 As you can see, this needle is absolutely tiny (see below image). I see a number of patients who for years thought that plucking their eyelashes was the only solution for misdirected eyelashes “trichiasis“. These lashes cause irritation as they rub against the cornea. Every four weeks these patients attend their GP or optometrist to have the problematic lashes plucked out. The needle above attaches to a “hyfrecator”, a small electric box. Local anaesthetic is injected into the eyelid to make it numb. Looking through a surgical microscope, the needle is stabbed into the follicle of the eyelash and a very low electric current is passed. This effectively destroys the lash follicle stopping it from growing a new lash. This procedure is performed in rooms and does attract a Medicare rebate. There are a number of others ways of permanently removing eyelashes. Other methods include cryotherapy, which is freezing the follicle; laser and intense pulsed light or surgically excising the follicle. At times, conditions such as epiblepharon or entropion can cause eyelashes to touch the cornea, and the solution to these two conditions requires surgery. I have misdirected lashes.please freeze them.iam tired of plucking. Hi Sheila, please come in for a consultation and I can help you with your problem. Kind regards Tai. My son needs to get the outer, upper corners of his eyelashes permanently removed with surgery as the grow downward. Is this a surgery that you perform? Yes thats something I can help with. Hi dr, I’m from Malaysia, I would pay a visit to you I have inwards eyelashes to pluck out. Can you advise the price?